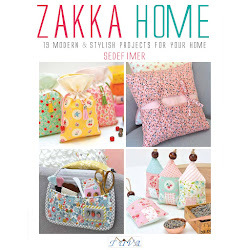 When I was at the US spring quilt market in May, I had the great pleasure of meeting the lovely ladies from Zakka Workshop - a really cool publisher specialising in reproducing Japanese craft titles in English. 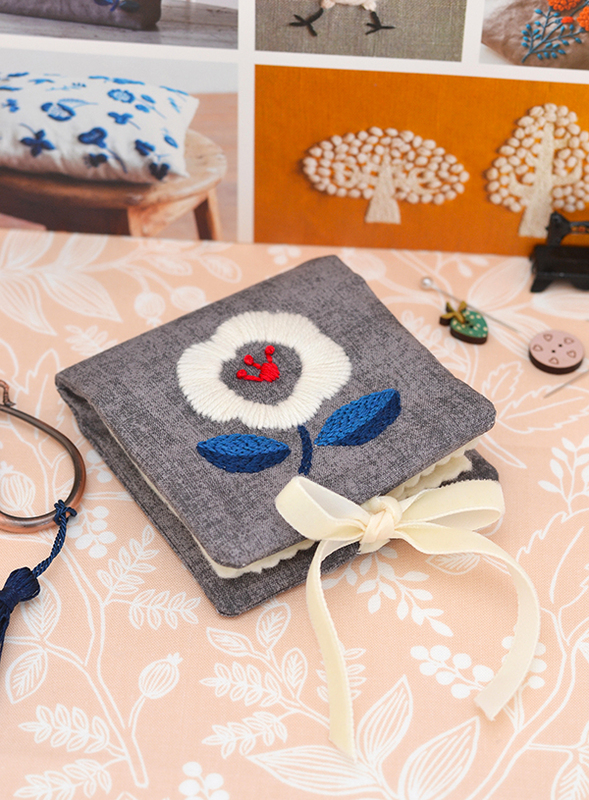 Not only new titles but also classic coveted ones that used to sell for a small fortune on ebay and Etsy (such as the 318 Patchwork Patterns by Kumiko Fujita and the soon-to-be-published-in-English-FINALLY Happy Flower Quilts by Atsuko Matsuyama). 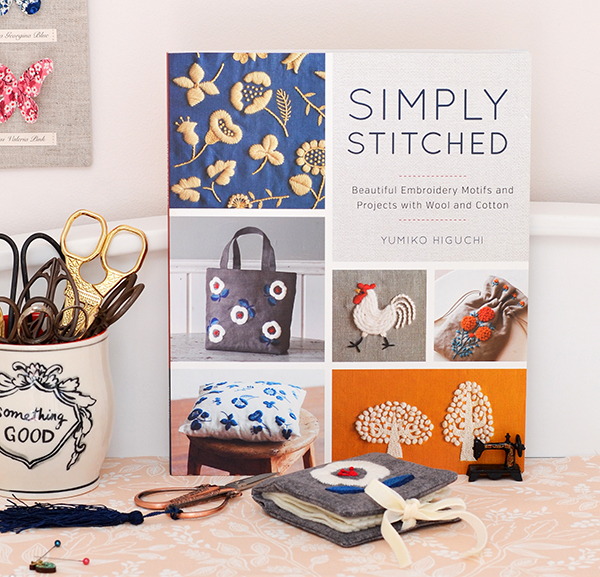 I couldn't resist picking up a couple of their new titles, one of which was Simply Stitched by Yumiko Higuchi. 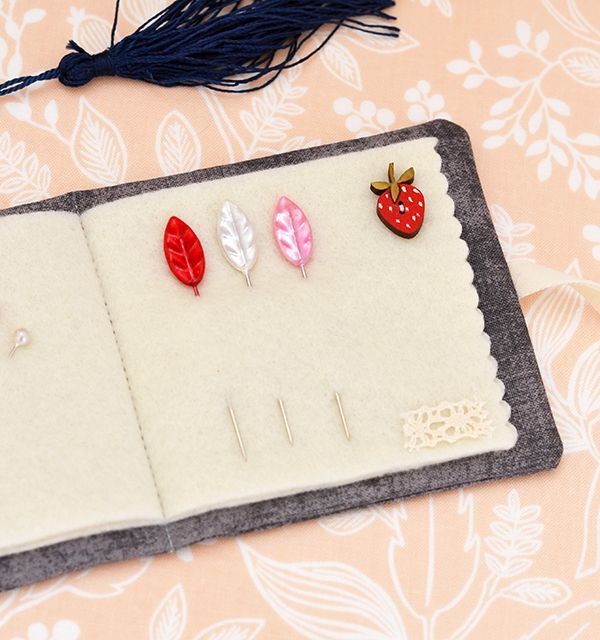 Yumiko is one of the most renowned embroidery artists in the world, having published multiple embroidery books. Her wool stitcheries are simply to die for - go check out her social media feeds or her website www.yumikohiguchi.com if you would like to see more! So much inspiration! I've made multiple wool needlepoint projects on canvas in my pre-Down Grapevine Lane days, but had never embroidered on fabric with wool before. Kinda kicking myself that I haven't tried it sooner - the thicker wool gives a lovely padded three dimensional finish that makes the embroidery designs really 'pop' off the fabric. I am a convert. (Tip: if like me you embroider a fair bit and sometimes are too lazy to use a hoop to stretch the fabric, don't do it for wool embroideries. This photo is my second attempt at this embroidery - the fabric warps WAY too much without a hoop). 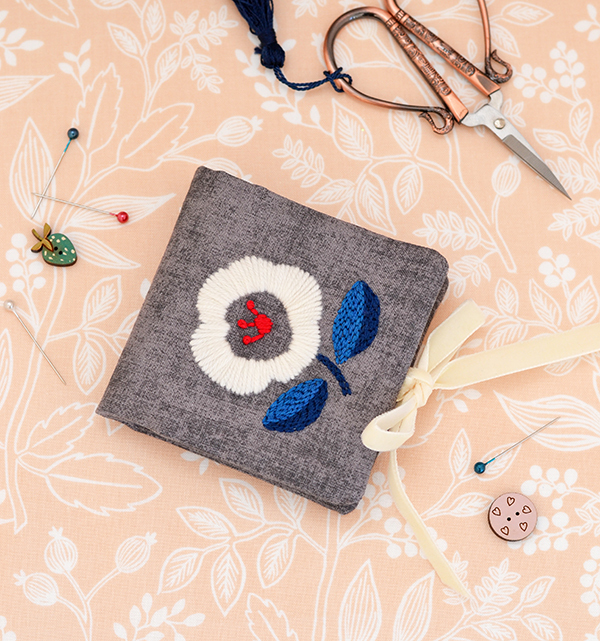 The project I made was the needle case project in Simply Stitched, but instead of the thistle pattern I used the poppy pattern from one of the other projects, as I loved its simplicity. It paired up beautifully with the dark grey background fabric (from Riley Blake's new range of basic cottons called 'Shades' - I love the velvety washed look - it's just cotton folks!). 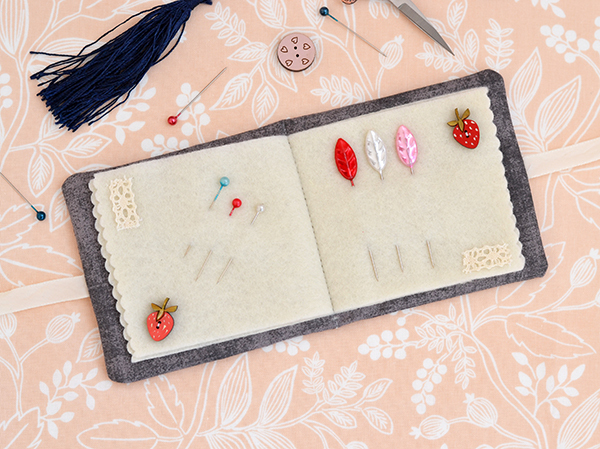 My inspiration for the decoration of the felt pages came from Amy Sinibaldi's beautiful needlebooks - a little lace, a button or two, edges trimmed with scallop pinking scissors - just the right amount of Zakka sweetness! 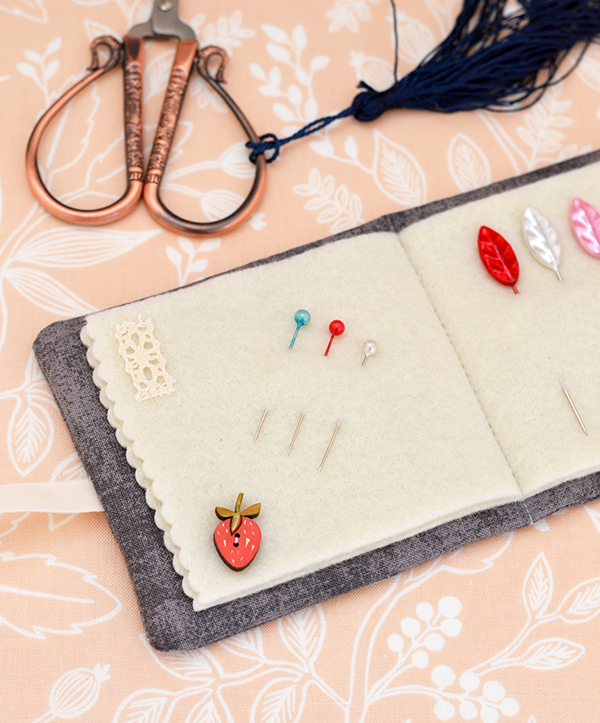 The cute strawberry buttons are from Ministry of Fabric and the pale peach fabric under the needle case is also available in the same shop here. I hope you like my needle case and are inspired to give wool stitchery a go. This book is full of so many amazing patterns, and it's very clearly illustrated and explained so suitable for all levels. Highly recommend! Wool embroidery is one of my faves! 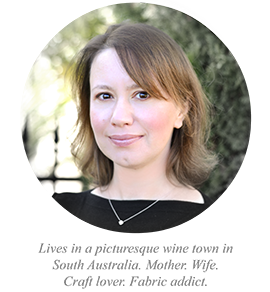 It has a chunky, rough quality that gives it a beautiful homely feel that I really love. I've done lots! 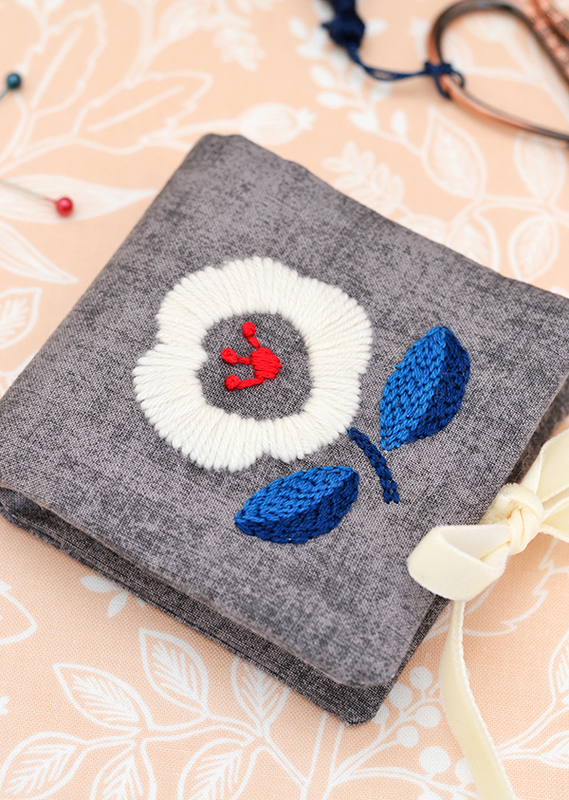 Your needle point works are amazing and so inspiring! I love the French knots! :) thanks! This is lovely, Sedef! 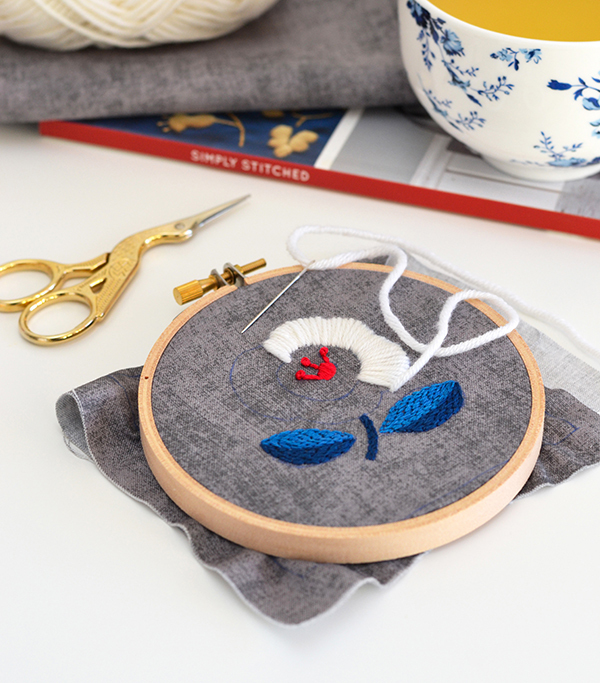 I've never tried wool embroidery - I might have to give it a try!